I suspect we all have movies that we "go to" when we simply want to unwind. A movie that we know we can trust to sooth our nerves while entertaining us time and time again. Sense and Sensibility is one of my "go to" movies. For a first time viewer, it may have some fairly stressful events and drama, but for me, it is an old comforting friend. You see, I know the way it all ends! The actors in Sense and Sensibility are so well suited to their parts that I often forget they are actors and do appear in other movies. In my mind, Emma Thompson will always be the sensible Elinor. Kate Winslet will always be the sensitive Marianne and Alan Rickman will forever be that dashing and stable Colonel Brandon, not Snape in Harry Potter. As a matter of fact, he plays those two parts so well and claims them so completely, one would think he was two different people. As for Hugh Grant, his youthful good looks and his ability to appear somewhat shy and naive, make him the perfect Edward Ferrars. I should note, I do know there are other versions of this movie, but this is the version I prefer and these are the actors I identify in their respective parts. The movie Sense and Sensibility is based on the book (same title) by Jane Austen. It takes place in the very late 1700's. In a time when women were most often completely dependent upon their male relations. In the case of the Dashwood family, the entire Dashwood estate was willed to one single male heir, John Dashwood, who was the son of Henry Dashwood and his first wife. It is important to note here that even the current Mrs. Dashwood did not inherit anything and was dependent upon the benevolence of John Dashwood or other relatives. After the death of Henry Dashwood, the Dashwood women all became the responsibility of their half-brother, John who was easy manipulated by his selfish wife, Fanny. The three Dashwood sisters and their mother are forced to move out of their home of luxury and wealth and into a small cottage owned by a distant relative, Sir John Middleton. The story is not only about their struggles to survive, but also the various romances of the young women. Unfortunately, their reduced economic circumstances made them no longer desirable alliances by the wealthier families, which made them less likely to marry back into the wealth of which they were born. There are broken hearts, shattered dreams, unexpected alliances and kindness, but there is also love. The kind of love that hopes all things and endures all things. For the forever hopeless romantic, this movie is an absolute must! There are many remarkable, quotable scenes in Sense and Sensibility, but none quite so palpable as the moment when Colonel Brandon says "give me an occupation, Miss Dashwood, or I shall run mad". His concern for the gravely ill Marianne, his stress and his need to do something, touch every heart in this unforgettable moment. This was the only video I could find with the quote focus. If you enjoy the works of Jane Austin, historical romance or simply romance, I have no doubt you will enjoy this awesome movie. 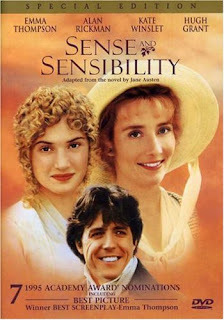 If it is your first time to see Sense and Sensibility, I recommend you have your Kleenex close by. I really must see this movie. It is on my to watch list. Thanks for a great review. Sounds like I might enjoy it as a movie more than I did the book, which I read a few decades ago. It's obvious I've forgotten most of the plot. It's always nice to have a back-up "go to" movie. I'll definitely add Sense and Sensibility to my watch list! How did I miss this delightful review? Thanks so much for telling me about this movie. Sounds like a winner. Makes me miss my sisters even more. Certainly one to put on my list.